Approximate Running Time. 60 mins Format. 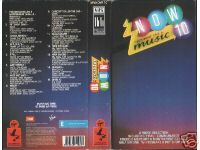 PAL VHS -EMI 1987 Track listing: Freddie Mercury + Montserrat Caballe - Barcelona; Pet Shop Boys - Rent; Communards - Never can say goodbye; M/A/R/R/S - Pump up the volume; TPau - China in your hand; Whitesnake - Here I go again; Wet Wet Wet - Sweet little mystery; Heart - Alone; Curiosity killed the cat - Misfit; Los Lobos - La Bamba; Bananarama - Love in the first degree; Cliff Richard - My pretty one; Nina Simone - My baby just cares for me; Erasure - The circus; Level 42 - It's over.